Unfortunately the image is only part of the truth. Israel is the one ‘state’ that came into being artificially by way of a United Nations charter agreement, not based on any traditional values that all other states were founded on. Yet even today Israel has yet to show the world any reason for their being here as a state among the community of nations. Other nations came with a heritage that did not need to be “invented” because they had their own populations of indigenous people, by which those ‘states’ were already known. Israel crashed into the civilized world and demanded that they be given not just a place among the nations of the world—which they had not earned in any civilized manner. Israel has always been a rogue state; an outlaw-region of the planet that has destroyed everything they have tried to touch since that day in 1948 when they demanded that they be given not just the rights of statehood—but their imagined status as well - as the only people on the earth who are worthy of life in this universe. Since that happened 66 years ago, the world has known nothing but bloodshed, tyranny, torture, genocide and blackmail from that tiny little parcel of land that was Palestine, before they were allowed to officially steal it from the Palestinian people—as the Jews at that time were fewer than 10% of the population, the illegal creation of the state of Israel was a crime against the Palestinian people. 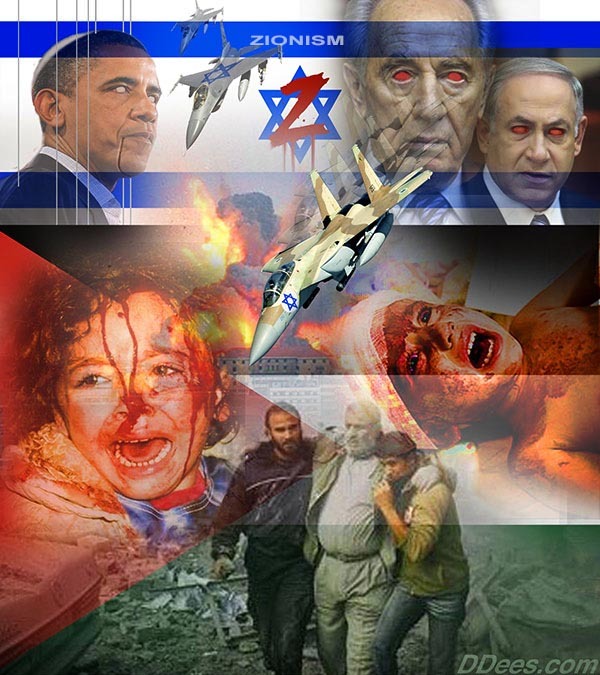 Born in blackmail, blood and hatred, Israel has continued to practice their terrorism and Apartheid practices from their admission to the UN, until today, where they are now 28 days deep into yet another genocide of the Palestinian people with the blood soaked hands of Amerika smoothing the way for them: Despite the objections of the rest of the planet—and so far Israel has not yet been shut down over anything they’ve tried time after time after time to do to other people. The time has come to force Israel to pay for her continuing crimes on the global stage and to face their own soon to be state-less-ness in this world. The political state of Israel must be driven from all the lands of the earth, along with all of their co-conspirators that have tried so hard to steal the planet for Zionism and for their pro-active political-piracy in every country where there is an Israeli Embassy ­ Israel needs to feel the full weight of the world they have so barbarically tried to murder. To read and understand the entire political history of Israel is to come to terms with what ‘global-terrorism’ has always been: Who were its first practitioners, who fostered that evil nightmare and who guided global terror to the place where it rules over all the rest of us today. Once you’ve done that, then you will know what Israel is, and what she has never done for anyone still alive in the world of the “now”. Israel is not about religion, it’s about an illegal political movement called Zionism which was designed to capture the entire planet for their members. Americans have had over fourteen years to do some homework, but most haven’t even bothered ­ now its time to get busy and find out for yourself ­ just who did what to whom, and WHY this has been the result of all that globally criminal behavior since long before the last 66 years of this obscenity against humanity.